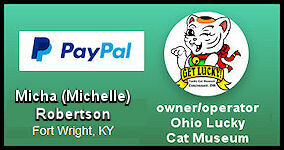 The Lucky Cat Museum is currently not a registered non-profit. All donations are included in our gift shop sales totals. We operate under an Ohio Transient Vendor's License and pay sales tax twice a year. All the money we do make from sales goes towards paying our monthly rent. We do intend to apply for non-profit status. It's one task on a very long list! Donations are always appreciated! We accept both money and maneki nekos! You don't worry about giving a neko we already have. Donated cats are added to the collection with the benefactor's name. The repeat is removed from the collection and is either sold in the gift shop as is, saved for future artistic purposes, or donated to auctions that support local cat rescues. Your donated kitty doesn't need to be new, or even in purrfect shape! I've gotten pretty good at repairing damaged cats!